The second man to walk on the moon once said, “My favorite thing to do on this planet is scuba dive.” This makes sense because some of the same principles apply; weightlessness, inability to sit still, and endless itch to explore. A diver of more than a dozen years, I’ve long shared this same sentiment with Mr. Buzz Aldrin. But it wasn’t until a few years ago where I had a diving experience where I literally felt like I was in outer space. The year was 2014, my wife and I went to Playa Del Carmen to celebrate the wedding of our friends Lilly and Mike. 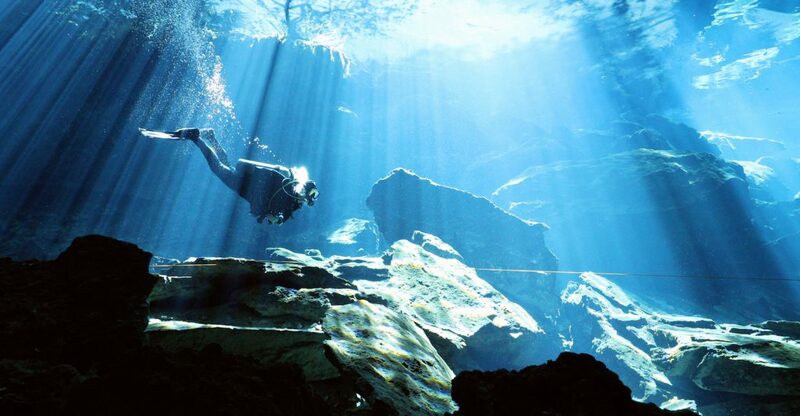 I was lucky enough to sneak away one day and dive these mystical caverns, Cenotes. I’d seen pictures of them in diving magazines for many years and it always peaked my interest. The location was the well-known Dos Ojos, or two eyes. The scuba shop was Scuba Playa and my Instructor for the day was Pepe Urbina Bravo. I was the only diver that day, so Pepe did an incredible job of making this a remarkably personalized experience. Fast forward two years and I purchased the top of the line 4K camera equipment from Rob Duncan at Backscatter. Rob was a huge resource in helping me figure out what the heck I needed because initially, it’s incredibly confusing. Camera body + lens = easy part but the underwater housing stuff is nuts to try to figure out alone. So back to Playa Del Carmen we went in late 2016 and Dos Ojos is of course where we started, Pepe to lead the way. I used a pair of the Gates Underwater Products G14 lights which are 14,000 lumens each for a total of 28,000 lumens! Pepe said he had never seen a Cenote illuminated like that before. We did two dives there, both a little over an hour and then wrapped our day up. The next day, it was off to Angelita which has a sulfur cloud down around 90-feet or so. I was amazed that, even while wearing a mask, you could smell the rotten egg smell of the sulfur. We did two dives there and went up and down the cloud while also checking out some swim through’s on our way back to the surface. Max depth was about 125-feet so needless to say, these weren’t as long as the Dos Ojos dives. Next, we were off to Kukul Kan and Chac Mool. This was a day I was extremely excited to dive like no other. In order to get the light rays to shine into Kukul Kan, it has to be very sunny. It had been cloudy half the time we were there and rain was in the forecast. So Pepe and I set out super early to try to catch a window of epic sunshine. We saw clouds rolling in so we started to just fly down the highway to get there and beat them. We actually ended up getting there way too early because the sun wasn’t even high enough in the sky to shine into the Cenote, whoops! Then, as we waited, the first ray of light shined through and in an instant, we were in the water. Learn more about Beacons Films.